Searching for that perfect allergen-friendly, candy-free cute DIY Valentine Card idea? I created these fun, gender neutral Valentines for my son to hand out to his classmates, featuring his most favorite toy ever, LITTLE PLASTIC SOLDIERS! For this year’s cards, we chose to use Revolutionary War plastic toy soldiers. My son is in 5th grade, so this might be his last time handing out the traditional classroom cards and having a class party! We’ve made other DIY cards, these & these, using small toys, for other elementary school years, because, well, I just like to do something a little different and liked finding slightly more boy-friendly cards for him to be excited to hand out to his school mates. And, for a cleverly fun teacher Valentine’s gift, I printed up my own wine label with heart tag to gift a teacher a bottle (#winning) a few years ago. You really can make some creative DIY gifts, using printables and basic supplies, quicker than you might think! I am all about simplistic, minimal effort, but charming DIY crafty goodness. My kid has been a big fan of little plastic army men toys since he was probably three years old! Such a simple, classic, enjoyable toy that has kept him busy for hours, many times! Previously, we’d done a different version of these cards using the green army men. The current Hamilton theater production hype and learning about the Revolutionary War is very exciting to my son and he even dressed up as a British soldier for his Halloween costume this past year. Of course we had to have a quick mom & son photo shoot to show off his costume last Fall. His class is going to participate in a Revolutionary War reenactment with other 5th graders in the area soon, so these cute Valentine Cards just seemed like an easy choice! We used this cardstock to print sturdier cards out on our home printer, these toy soliders (which my son already had) & washi tape from Target, that we had on hand at home, but you can easily purchase similar items at various places online or at a craft store near you. I created our cards printable using my favorite online editing site PicMonkey and then printed them out and cut them down to individual size. 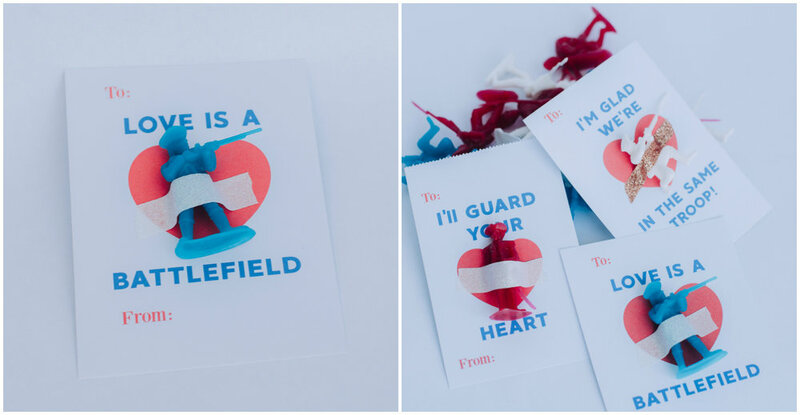 Use our FREE PRINTABLE SOLDIER VALENTINES here! Then, the only thing you have left to do is to have your child personalize each card with their classmate’s names, salute them and wish them a Happy Valentine’s Day when they hand them out! Voila! You’ve got your very own homemade, unique Valentine’s Cards that work great for boys & girls and awesome for candy-free classrooms or nut-free schools! Everyone loves a little non-edible trinket thrown in the mix when kids are getting a few too many special sugary treats. And, if you prefer, you can easily include a candy treat alongside your DIY cards. Enjoy!